It was a case of déjà vu for the supporters of promising intermediate galloper Stella’s Honour as red hot Rory Hutchings put in an inch perfect, rail hugging ride to guide the four-year-old daughter of O’Reilly to victory at Te Rapa on Saturday. It was the mare’s second win in her current campaign and came in eerily similar circumstances to her Tauranga victory back in December when under the stewardship of Craig Grylls she also produced a rails hugging effort to gain victory. “It was just about a carbon copy of Tauranga wasn’t it,” exclaimed co-trainer Chad Ormsby when spoken to twenty four hours after the race. “That’s the best way to ride her as you have to give her time to settle and get her breathing right but once she is in that rhythm she has a really good turn of foot which she showed again on Saturday. Ormsby was confident the mare was now in a position to fulfill the potential she had shown earlier in her career. “I was speaking with Sir Patrick Hogan about her and he said the family were slow maturing so hopefully now she has strengthened up she can go on with the job,” he said. 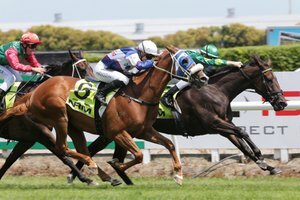 It was a good day for the famous emerald green colours of Sir Patrick and Lady Hogan with Stella’s Honour carrying them to victory just ninety minutes before Irish Encore made it a double on the day with a win at Awapuni.